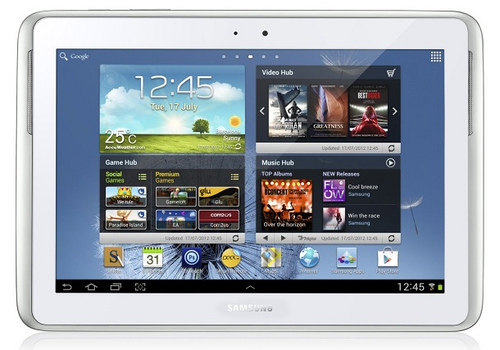 Samsung has introduced its latest tablet computer Galaxy Note 10.1. The tablet is marketed at a price of around $ 600 (for the model internal memory capacity of 16 GB, 3G + Wi-Fi). Galaxy Note 10.1 suited for professionals, designers, or for those who have a hobby of drawing because it supplied stylus called S Pen. This tablet has a multi-screen feature that can open two applications simultaneously in one view. Its features are reinforced by a quad-core processor speed of 1.4 GHz, 2GB RAM, screen resolution of 1280 x 800 pixels, and running the operating system Android 4.0 Ice Cream Sandwich. Bersensor rear camera of 5 MP with LED flash and a 1.9 MP front camera. You have finished reading Samsung Galaxy Note 10.1 Tablet and many articles about Tech Gallery in our blog this, please read it. and url link of this article is https://littlebitjohnny.blogspot.com/2012/12/samsung-galaxy-note-101-tablet.html Hopefully discussion articles on provide more knowledge about the world of new tech gadgets.